So chill, this nice reggae style song from this italian band. They have been active since 1993 and are based in Rome, the most unbelievable city in this galaxy. 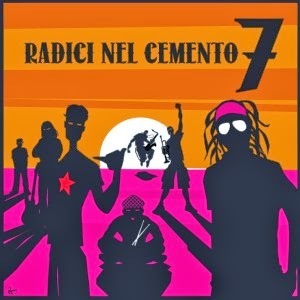 Starting as "Roots in Concrete" the band decided in 1995 to change the name to the italian "Radici nel cemento" which is just the exact translation of the english name. In 1996 the group releases the first self titled album on the famous italian label "Gridalo Forte Records" (Shout it out loud) and promotes the record on a first tour through the country and some gigs in other european countries. In 1997 they start a brief collaboration with Charlie Anderson from the Selecter playing two gigs together in Rome. In 1998 they play gigs as the backing band of the "padrino del SKA", the godfather of SKA laurel Aitken and they release a second album "Popoli in vendita" (Peoples Sellout) with the single "Guns of Brixton" the famous Clash original. Next album "Alla rovescia" (Upside Down) appears in 2001, spiced with collaborations (Roy Paci) and followed by extended tours, also as a backing band of Alton Ellis. 2004 brings "Occhio!" (Eye), 2006 "Ancora non è finita" (It's not finished yet) and 2008 "Paese di Pulcinella" (Land of Pulcinella), all of them released on V2 Records. Their most recent album "Sette" (Seven) appeared in 2013. The Band still going strong in Italy's Reggae and Ska Scene. Viva lo SKA!